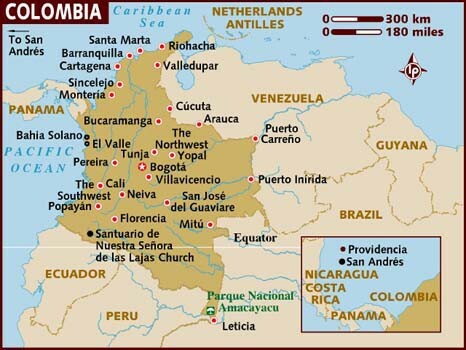 Colombia is in the northern tip of South America. It is covered in rain-forest, coffee plantations, and by the Andes Mountains. It borders 5 countries which are Panama, Ecuador, Venezuela, Peru and Brazil. In Colombia, they speak español colombiano. There are about 71 different languages spoken there in. Unitary State- a state governed as a single power in which the central government is ultimately supreme and any administrative divisions exercise only the powers that the central government chooses to delegate.